"The tattoo is from the front cover of a vintage Heavy Metal comic book my ex-boyfriend used to have. The sleeve was adapted from the drawing by Avelino Avilia at Spirits in the Flesh Tattoo Studio in San Francisco. I had the work done in 1997. There was no deep meaning behind it. I simply found the original image aesthetically pleasing." What follows is Christina's poem "Charity, " which, she says, "was supposed to be published in [another magazine] this year, but they fell off the face of the earth." Their loss is our gain, I say, and they haven't responded to her queries about the poem, so this would mark it's first publication, I believe. Christina Continelli is a poet, fiction writer, and essayist. She cut her poetry teeth in the San Diego spoken word scene. In 2004 she moved to Oakland, California to attend the MFA program at California College of the Arts. Her work has appeared in Goodfoot Magazine, Slice, How2, and Monday Night Lit. 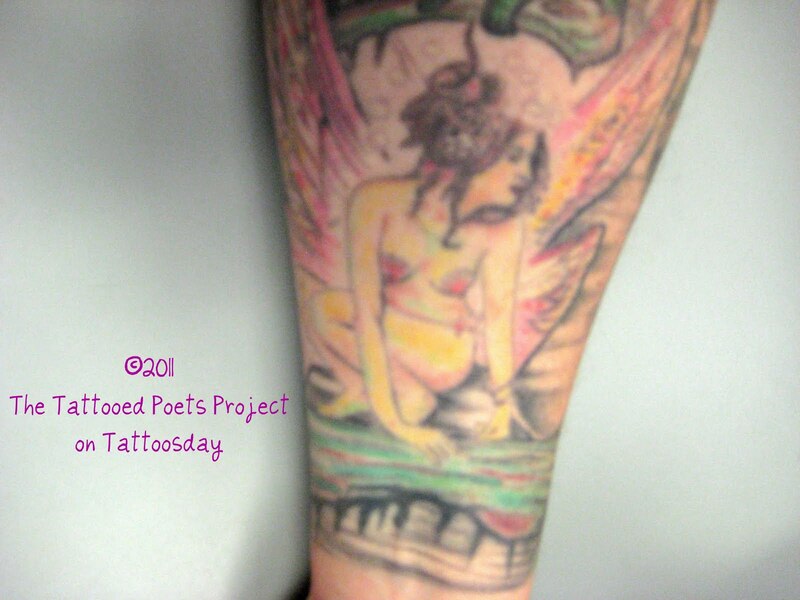 Thanks to Christina for sharing her poem and tattoo with us here on Tattoosday!